This is just the same as How to disable Taskbar Thumbnail preview in Windows 8 ? . You don't need to download a program to do this. You can search for NumThumbnails Registry on the Internet and find several answers, some have a program. But the best just refer you to updating the registry. 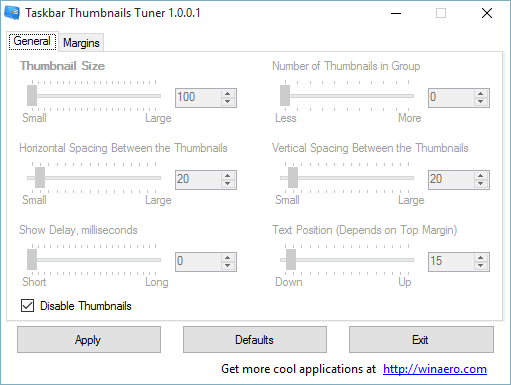 Change Taskbar Thumbnail Threshold by setting NumThumbnails to 0. If you don't have a NumThumbnails DWORD, then you'll need to create one. Not the answer you're looking for? Browse other questions tagged windows taskbar windows-10 thumbnails preview or ask your own question. How to disable Taskbar Thumbnail preview in Windows 8 ? How to make Windows 10 taskbar thumbnail previews bigger? How to : Run an App WITHOUT a taskbar button ? How can I force taskbar buttons to ALWAYS be on the same display as their windows in Windows 10? How do I hide an “entry” in the taskbar but keeping the window of the application open and visible?